Do you want to help? If you have an ardent passion towards our cause and you want to support us then roll up your sleeves and get to work! We have wide range of opportunities. Every one of us, at some time in our life, feels like contributing towards the betterment of the society. But among the various obstacles faced by many of us in doing so, are limitations pertaining to time. In order to tackle these and give you the opportunity to support our cause of uplifting underprivileged school children in India, The Akshaya Patra Foundation has made volunteering provisions that will give you the freedom to spread our message without disturbing your schedule. Read on to know more about the volunteering options at Akshaya Patra. There are various ways in which we can contribute towards society’s progress. It’s relatively easier to support a cause pertaining to the upliftment of underprivileged children. Every child loves an entertaining event like an art and craft workshop or a magic show. Each of us can make a difference to the lives of these children in various ways. 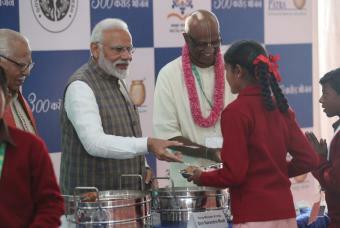 Either you can initiate and organise an event at a Government school where Akshaya Patra provides meals or you can be part of an event that is organised by the organisation. It’s your choice! The Akshaya Patra Foundation has organised numerous events that have assisted in fundraising to support our cause. OUTRIDE HUNGER - 'Outride Hunger' was a biking event organised by The Akshaya Patra Foundation in association with Wrangler. Over 300 participants from various biker clubs along with individual bikers wholeheartedly participated in the event. The event was a great success. Read more. TEACHER’S DAY CELEBRATION - September 2013 was an exciting month for many children and teachers from several Government schools across Bengaluru. The entire month was packed with different cultural activities performed by the students dedicated to their teachers. The programme was organised by the employees of The Akshaya Patra Foundation. CLICK IT WRITE – A BLOGGERS’ AND PHOTOGRAPHERS’ MEET - This was a bloggers' and photographers’ meet, spread over two days, organised by The Akshaya Patra Foundation at Banjarpalya Higher Primary School, Kanakapura (Bengaluru). The participants of the meet spent a whole day with the school kids teaching them various activities. After the event, the participants wrote blogs and created photo galleries of their visit, made them accessible to the public and shared them with us. A WALL OF HOPE AND JOY – PHOTOGRAPHY EXHIBITION - A photography exhibition that showcased various images of children shot by different photographers from all over the world, was held in Bengaluru for three days. The exhibit attracted over 1000 visitors. When we conduct such activities and events, you can spread our message in your own way. You could write about your experience while volunteering with us, or visit our kitchens and promote our cause. After all, the smallest efforts can bring the biggest smiles.